Once upon a time, oh maybe about 9 years or more ago, I would have looked at the above scene with delight. The first thing I’d go for is a Reese’s Cup. Oh how I miss those! I remember the thrill of going out trick-or-treating with my siblings and coming back home with the loot. We used to take for granted something so small as being able to enjoy it without reading labels. Having children with deadly food allergies has put things into a different perspective. What once gave me warm fuzzy feelings now gives me a feeling of dread and apprehension.During this time of year store owners everywhere are offering my kiddos candy. It’s EVERYWHERE!! Having strangers dig their hands through a bowl of peanut containing candy to find a “safe” candy for my child is just not practical. Packages can tear open and residue can trickle out onto otherwise “safe” candy. A common scene while checking out at the grocery store – “would you like a piece of candy?”. This very well meaning question causes anxiety for me, the mom of children with deadly food allergies. I have to ask the question(and sound like overprotective food allergy mom) – Do you have the package? Can I read it? In most cases I have to politely decline explaining that my sons have food allergies, and that it could kill them..yada yada yada. I then get the looks – they look at my son with pity. They look at me with suspicion – Poor kid, his mom won’t let him have candy. It’s not only Trick or Treating and Grocery Shopping that’s unsafe either. Many churches have Fall festivals this time of year and there is candy everywhere – Snickers, M&M’s, Reese’s Cups, and so on and so on. All of which are dangerous for my kiddo. To those who provide candy to children during this time of year I have a suggestion. It’s ok to have the grab bowl of candy for the kiddos with whatever yummy treats you desire! Keep it in the original packaging so the overprotective food allergy mom can read it and approve it! Allow the kiddo to reach into the bag & grab it for him/herself. This small gesture would help me and my kiddos enjoy this fun time of year so much more! 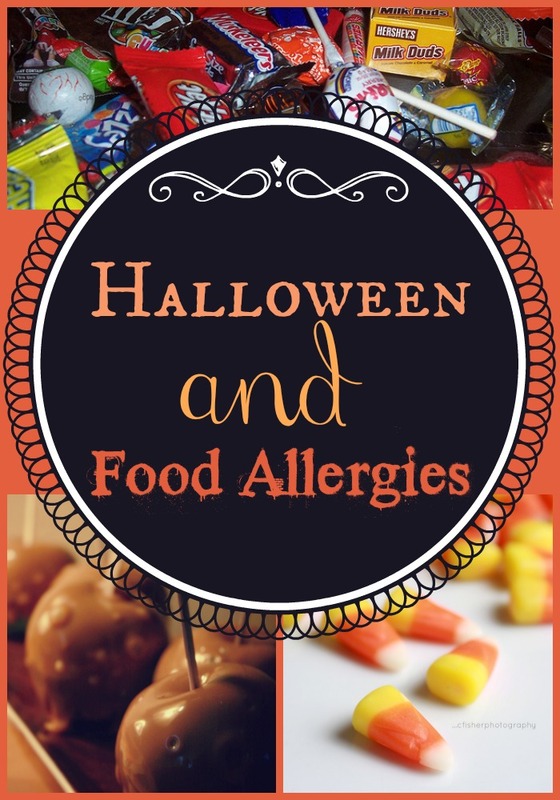 How do you handle food allergies during this time of year? I’d love to hear your suggestions! Thank you so much for posting this! I sometimes feel so alone in these emotions and worries. I am very anxious about trick or treating with my 3 year old this year, because it’s the first year that he is old enough to try digging into his candy while we are trick or treating. Last year was easy…I just separated and inspected everything when we got home. But I can totally see him trying to get into the candy while we are out this year. Do you suggest turning candy down at people’s doors? Do you find out what they are giving out before they give it to your kids? How do you handle this in a way that isn’t perceived as ungrateful? Candice, what I do with my son is that he gets to go trick or treating and get all the candy that he wants, I take only the candy I know 200% is safe and tell him this is his candy and the rest he trades in with my for a small toy that I get him. He loves the idea. I always did this with him and he can not wait to trade in his candy. I hope this is a idea that maybe you can use. Oh and Dad takes the candy that my son traded with us to work so I do not have to worry about it. Now if she can see that there is something in the bowl of candy that she can have and the person gives her something else, she will politely ask for the starburst (or whatever) and say she is allergic to the other. Even as a mom with NO issues at our house, we only give out Dum-Dums & Smarties & Laffy Taffy — since if there are leftovers, those are the only candies I’d want my kids to have access to for more than the next week. And my kids are ALSO not allowed to touch anything in their bag, if they want a piece, I look it over before I pick one to give them. Those are all great suggestions! My dd who is 18 months is allergic to dairy and eggs. April Gaines Portera via Facebook / Those are all great stiuesggons! My dd who is 18 months is allergic to dairy and eggs. I am known as the Halloween juice box lady in our neighborhood. We live in the back of a large development and the kids are always so thirsty when they get back this far. I put juice boxes and bottled water in a cooler and let the kids pick which one they want. they usually rip it open and start drinking it right away. It is very rewarding to see, and I feel that I’m giving them something healthy. The juice box idea is GENIUS!! I always carry one with us because my son gets thirsty. Great idea for trick or treaters! My son is allergic to peanuts, so we try hard to avoid them whenever possible. I always buy a big bag of Dum Dums (his favorite) and have them at the house so we can switch those out with candy he can’t have. Fortunately, his school’s Halloween carnival is peanut-free, and the majority of his treats come from there.